An angle inscribed in a semicircle is a right angle. If an angle is inscribed in a semicircle, then it is a right angle. If an angle is determined by the endpoints of a diameter and a third point on the circle, as the vertex, then the angle is a right angle. 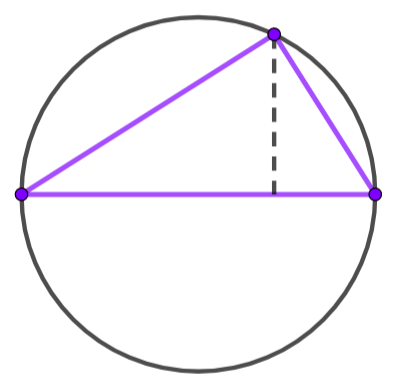 An inscribed angle which is a right angle is inscribed in a semicircle. If a right angle is an inscribed angle of a circle, then it is inscribed in a semicircle. If a right angle, ∠ABC, is an inscribed angle of a circle, then segment AB is a diameter of the circle. This may be my favorite theorem in mathematics!